Known as one of Johannesburg’s most popular dining destinations, Montecasino is a little piece of Italy set in the heart of Fourways. Experience the romance of Tuscany whilst enjoying the finest award-winning wines and speciality steaks that The Hussar Grill has to offer. Stop by for a casual gathering with friends, a joyous birthday celebration, romantic anniversary or a business lunch. 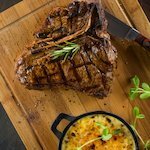 Their food combined with their traditional grill room setting and the ambience of Montecasino, makes dining at The Hussar Grill unforgettable.